Have You Been To The Swan And Dolphin Resort? Here Are The Top 10 Things We Think You'll Love! Have You Been To The Swan And Dolphin Resort? Here Are The Top 10 Things We Think You’ll Love! Disney Fanatics: They can’t shut up about their latest jaunt to visit the Mouse. It’s only natural that frequent visitors develop opinions about everything. Debates about which hotels are top are as fervent as any park-related argument. 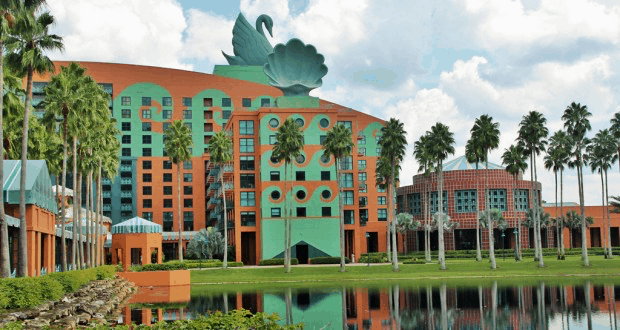 Growing in popularity due to its unbeatable location, sheer size, and recent renovations, the Swan and Dolphin belong on every Disney Fanatic’s short list of go-to lodgings. Couples, business travelers, and laid-back Disney types, rejoice! This resort’s theming is contemporary and subtly tropical. So, if the word “tourist” makes you feel a bit itchy, these properties might offer the type of environment you desire. This, in addition to other reasons we’ll cover later, make the Swan and Dolphin a pleasant respite from the exciting hubbub of Disney’s parks. Many appreciate these hotels because of their affordability, as compared to Disney’s official resorts. The Dolphin is Sheraton property, while the Swan a Westin. This difference in ownership allows them to set pricing that is typically lower than Disney properties of equal classification (i.e., 4-star). This makes both hotels a surprising “bang for your buck.” Parking may seem pricey, but flashing your room key at Disney’s parking attendants will grant you a space at the parks for no additional fee. From all heights and all sides, the Swan and Dolphin offer some of Disney’s best views. Even from ground level, you will gaze onto impeccably groomed Disney grounds. From up high in the Dolphin, you can spot parts of the World Showcase from one side, or the Tower of Terror from the other. Many rooms offer balconies too, so while the Swan does not climb as high as the Dolphin, its balconies still offer a wonderful perch for spying Epcot fireworks and Boardwalk fun. One of the things that makes the Swan and Dolphin truly special, is that they currently hold the distinction of a “One Palm” rating from the Florida Green Lodge movement. This designation means that special consideration is taken to conserve resources like water and electricity. Guests may be offered incentives if they choose to use the towels and bed sheets provided for the duration of their stay. For a weekend trip, this is no large sacrifice. Past incentives include a small credit for use at the resort’s many restaurants or loyalty points for frequent Sheraton/Westin visitors. Would you like to stay somewhere that boasts multiple swimming spots and a sandy beach? The Swan and Dolphin offer both and then some. This makes for a fantastic break from the parks midday, when crowds and temperatures are swelling. The largest pool is grotto-style, with waterfalls and lounge chairs throughout. If swimming is not exactly your thing, there are several whirlpools to sooth your aching muscles. Or, just find your way to the Mandara Spa inside the Dolphin for an even more relaxing break. The hotels’ resort fee does not come without its benefits. Room amenities such as Starbucks coffee and tea, waters, mini fridge, and internet access are included. While these two properties are often hopping with activity, the rooms are all interior access, which makes them much more quiet than most official Disney lodgings. The unusual shape of the Dolphin also means that there are many larger quarters at the ends of hallways. Originally conceived as a means to attract guests who sought convention space on Disney territory, the Dolphin houses the largest meeting rooms, all named in oceanic themes. The Swan’s spaces are named of course, after birds. One of the most popular events hosted at the Swan and Dolphin is the Food & Wine Classic. The ticketed event offers patrons various menus, tastings, and classes all within the resort’s own space. Conveniently enough, it coincides with Epcot’s own annual Food & Wine Festival. Though the cost of these 4-star properties is comparable to Disney’s own 3-star properties, it still offers many of the same benefits as the official Disney hotels. Early access to FastPass+ reservations, Extra Magic Hours, Disney Character Dining, and official park transportation/parking are just a few of those exciting benefits. Perhaps one of our favorite things about this resort is the overabundance of food. Choices range from high-end to counter service, sushi to ice cream. With 17 total restaurants on site, and character dining to boot, you’ll have no need to leave the premises at odd hours for a snack or a good time! Picabu is a particularly popular option; offering cafeteria-style dining 24 hours a day, it’s convenient for night owls and early birds alike. There are few inns within the Walt Disney World Resort that can compete with the location of the Swan and Dolphin. Within walking distance of The Boardwalk, Epcot, and Hollywood Studios, you can still take a ferry to those neighboring locations if you’d rather sit. Plus, Walt Disney World’s own shuttles pull up to your front door all day long. With recently completed updates to the Swan’s guestrooms, there’s an understandable uptick in interest surrounding these two properties. With renovations at the Dolphin scheduled for completion in 2017, will prices at these places of respite surge? Only time will tell. Until then, if you make a reservation, you may just see me there.